You know those nights after dancing for hours in your – well in my case never less than 3 inch – stilettos. Feet pounding, hurting, in much need of a nice massage. Now, you are on your way back to the car or the pizza joint down the block and can’t even imagine how you are going to get there. 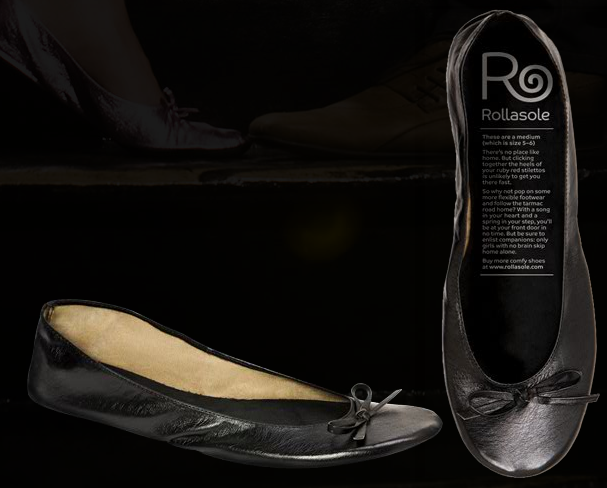 Well, if they have it their way, Rollasole ballet flats will be sold in a vending machine at local club near you. Okay that was cheesy. But really, these ballet flats, already sold in several clubs across the UK, will cost about $7. They come rolled up in little balls and even include a matching bag to carry your heels in. Can we say C-L-E-V-E-R. I will end on this note, $7 can add up real quick! Vending machine with Rollasole for sale. Rolled up ballet flat and bag to carry your heels in. Rollasole's unrolled in black. They also come in gold and silver. I say bring your own! dose it fit all sizes?